After a long day of napping, ripping the squeaky thing out of every stuffed toy in the house, and hunting for food scraps, your dog probably needs to chill out and wind down, too. And now, while you relax with a glass of chardonnay, your dog can do the same with a bowl of CharDOGnay. That is, non-alcoholic wine made just for dogs. Apollo Peak, the Denver-based company that quickly became famous for its line of cat wines earlier this summer, recently announced the launch of two new, pet-friendly wines designed specifically for your canine companion. Fittingly dubbed The ZinfanTail and The CharDOGnay, the wines are a blend of herbs and beets that are mixed to sort of look like actual wine for humans -- without the alcohol or other ingredients that could be toxic, according to a press release. 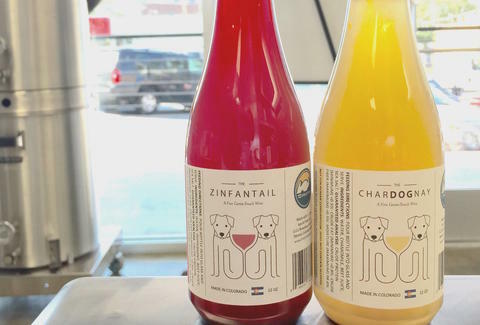 The company describes The ZinfanTail as "a beautifully designed red wine for dogs" that's made with "a blend of Peppermint leaves that can help to soothe digestive upset, reduce gas, and help relieve nausea." As for the The CharDOGnay, Apollo Peak claims it's a "natural relaxant for dogs while also having added health benefits." More details are available on their website. Both of the new dog wines come in 12oz bottles and are currently available for pre-order via Apollo Peak's online store for close to $18, which is probably at least a few bucks more than the budget bottle of wine you picked up for yourself on the way home from work. But, then again, it appears to be slightly more affordable than dog-friendly beer. Oh, and way fancier, of course. Tony Merevick is Cities News Editor at Thrillist and wonders if there are certain dog bone and dog wine pairings. Send news tips to news@thrillist.com and follow him on Twitter @tonymerevick.